A map of all the drone laws in the United States. The ACLU recently published on its technology blog a list of 28 states that are pursuing regulations for unmanned aircraft systems, or UAS. They're more commonly referred to as "drones," and in fact many of the proposed laws use that exact word. I dug further to find out what lawmakers are actually proposing. You may click on individual states in the above map to learn more about specific legislation. Out of the 28 states, 14 are proposing limitations only to law enforcement. In most cases, proposed legislation would make it illegal for law enforcement to use an unmanned aircraft without a warrant. Some also call for evidence obtained from a "drone" to be destroyed after a specified period. A few ban any government entities from using the technology altogether. Despite JournoDrone 2 still being in the shop after its maiden flight, drone development is continuing onward and upward. Above is an aerial photo taken from my latest drone project, which has caused that previous drone to collect dust in the basement. However, this new drone is superior in at least a couple of ways. One, it's much more stable in flight, thanks to its 68.5" wingspan. Its size also means it can loft a larger payload. The photo above was taken using an 11Mpx GoPro Hero 2, which is small, but has a not insignifcant weight penalty. JournoDrone 2 was a plastic shell that I wrapped in carbon-fiber and epoxy, which could take a crash on the nose without much harm. 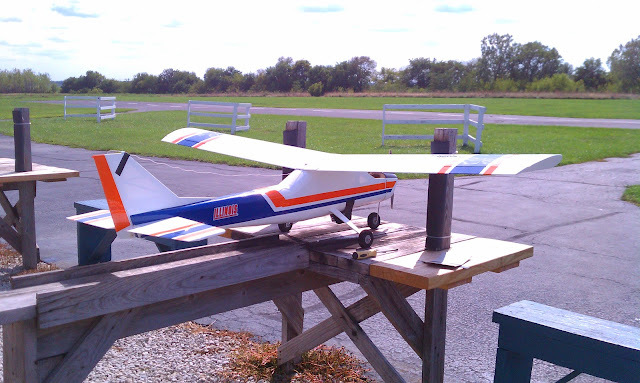 This newest drone is made of balsa wood, but it's such a docile aircraft that the need for crash resistance is minimal. All that balsa, some 5 or so pounds of it, is also pretty good at flexing and absorbing a hard landing. Yesterday my colleague, Acton Gorton, sent me an email that the Association for Unmanned Vehicle Systems International (AUVSI), an industry group representing defense, civil and commercial drone developers and operators, had released a “code of conduct” for the unmanned aircraft systems industry. The code is broken into three sections, relating to “safety,” “professionalism,” and “respect.” The code is good as a framework for further discussion, but it’s not terribly specific as-is. For example, the safety portion of the code requires “crew fitness for flight operations,” but mentions no standards by which crew fitness should be judged. Likewise, it requires “Reliability, performance, and airworthiness to established standards,” but does not specify what those standards might be. The AUVSI also is not the first to develop a code for UAS operations. That first likely belongs to RCAPA, the Remote Control Aerial Photography Association. The RCAPA has an extensive list of guidelines that cover drone construction, flight operations (including checks for control systems, and operations before, during and after flight), and even maintenance logs. AUVSI likely is keeping broad definitions because it is trying to cover large swaths of the drone industry, which encompasses a wide variety of devices and goals, whereas RCAPA is mostly aiming to represent individual professionals and hobbyists who use drones specifically for aerial photography. But both are similar in that they are trying to safeguard the people who develop and operate drones. When I launched DroneJournalism.org in December, 2011, I had a purpose in mind: to become a hub for developing the ethical, educational and technological framework for the emerging field of drone journalism. Hoping to become the “Wiki of Drone Journalism,” I opened much of the website to professional colleagues who have an interest in the field. Registration is still opened to interested parties. Since launching the site, my co-developer and I have built two fixed-wing drones, destroyed one of them in testing, and are cobbling together a multi-rotor journalism drone. But we’ve added very little to the site in terms of drone journalism ethics, and I hope to change that. Some of the following is from previous posts on DroneJournalism.org, and those form the basis of a code for drone journalists I am proposing. 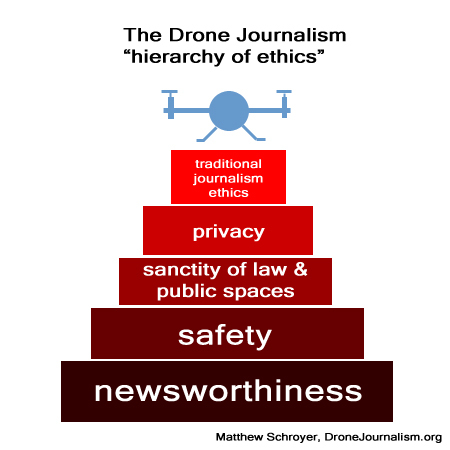 The most recent additions to the code involves a tiered approach to drone journalism ethics that borrows from the philosophy of Maslow’s pyramid.